The National Society of the Sons of the American Revolution was organized on April 30, l889 -- the l00th anniversary of the inauguration of George Washington as our nation's first President. We have used the acronym SAR to identify ourselves for over l00 years. 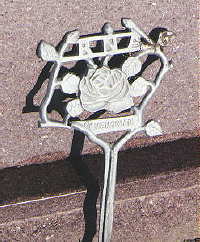 The SAR was conceived as a fraternal and civic society composed of lineal descendants of the men who wintered at Valley forge, signed the Declaration of Independence, fought in the battles of the American Revolution, served in the Continental Congress, or otherwise supported the cause of American Independence. The National Society was chartered by an Act of the United States Congress on June 6, l906. The charter was signed by President Theodore Roosevelt, who was a member of the SAR. The charter authorizes the granting of charters to societies of the various states and territories and authorizes the state societies to charter chapters within their borders. The DAR, founded in 1890, is a volunteer women's service organization dedicated to promoting patriotism, preserving American history, and securing America's future through better education for children. As the most inclusive lineal society in the country, DAR boasts 170,000 members in 3,000 chapters across the United States and internationally. The Sons of Union Veterans of the Civil War was a creation of the Grand Army of the Republic (GAR) which was formed in 1866. 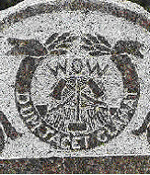 Wanting to pass on its heritage, the GAR in Philadelphia, Pennsylvania created a Corps of Cadets in 1878 which later became the Sons of Veterans of the United States of America (SV). The SV units functioned much as National Guard units and actually served along with state militia during the Spanish American War. 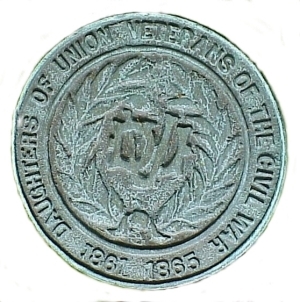 In 1904, the SV elected to become a patriotic education society and in 1925 changed its name to Sons of Union Veterans of the Civil War (SUVCW). However, to keep the military aspect alive, the SUVCW created within the organization the Sons of Veterans Reserve (SVR) which was carried on the Army rolls as a Reserve contingent. Some SVR units served with the Army during World War I. After World War I, the SVR was listed as a training company of the U.S. Army. In more recent years, the SVR's mission has become historic, ceremonial, and commemorative. Prior to disbanding and before the death of its last member, the GAR officially designated the SUVCW as its successor and heir to its remaining property. The final Encampment of the Grand Army of the Republic was held in Indianapolis, Indiana in 1949 and the last member, Albert Woolson died in 1956 at the age of 109 years. May 30, 1885 ~ Five young women, Harriett Knapp, Frances Merwin, Olive Howard, Eva Merwin, and Bertha Martin, stood at the edge of the Massillon, Ohio cemetery while Memorial Day services were held. They watched as their brothers and other young men, members of the Sons of Veterans, honored their fathers who had so valiantly fought for the Union Cause in the Civil War. They decided to form a group of daughters of Union Veterans so that they too could honor their fathers and other Union Veterans. They agreed to meet June 3, 1885 at the home of Eva Merwin. These young ladies were aged 15 and 16. It was from this beginning that The Massillon Daughters of Veterans grew to be Daughters of Union Veterans of the Civil War, 1861-1865, Inc., a national, federally chartered, organization. Freemasonry, a worldwide fraternal organization, often calls itself "a peculiar system of morality veiled in allegory and illustrated by symbols." Its members are joined together by high ideals, of both a moral and metaphysical nature (and, in the majority of branches, by a common belief in a Supreme Being). Freemasonry is an "esoteric art," in that certain aspects of its internal work are not generally revealed to the public. Masons give numerous reasons for this, one of which is that Freemasonry uses an initiatory system of degrees to explore ethical and philosophical issues, and this system is less effective if the observer knows beforehand what will happen. The women's auxiliary to the Modern Woodmen of America. The women's auxiliary to the Improved Order of Red Men. The photos of the Woodsman of the World and the Mason were contributed with permission by Dave from his site at Phoenixmasonry Masonic Museum. 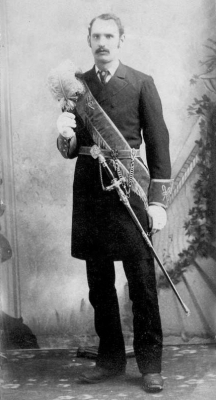 The photo of the Knight of Pythias was contributed by Harris Hill with special permission and is not to be reproduced in any way. 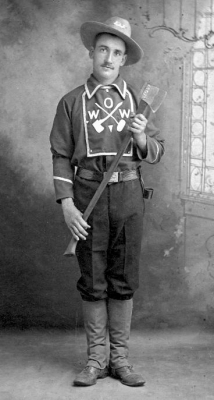 My grandfather, Robert Lee Russell, was an Odd Fellow and my mom, Marian Russell Koska Elgin, was a Rebekah. I still have Grandpa's old Odd Fellows book. I remember how lovely Mom looked in her long white Rebekah gown and wish I had a photo of her like that. She wore special earrings and a necklace that she never wore for anything else. I don't believe they were official Rebekah jewelry, but they looked impressive, nonetheless. There was an Odd Fellows ~ Rebekah hall above one of the stores in my home town of Plainview, MN. There were several occasions when Mom had me perform on the piano for social events. I remember waiting outside the hall and falling asleep on a big old couch while the meeting went on. When it was over, women went to the kitchen and prepared food and coffee for the social hour. I remember a woman breaking an egg into the huge old coffee pot and I couldn't figure why she was doing that! The hall is still there but I don't know if it's in use anymore. The store below has been turned into a very nice restaurant: "The Rebekah." They serve the best tomato soup I've ever had, glorious sandwiches and cappuchino. Lining the wall are old display cabinets filled with regalia and memorabilia. There are many photos of the organizations on the walls, and the old piano I played on is proudly displayed on a platform in the window.